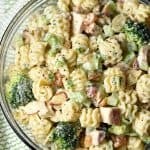 Seasoned chicken, broccoli, golden raisins, celery, and a wonderful creamy dressing come together to make this awesome Chicken Broccoli Pasta Salad. A total crowd pleaser, perfect for summer gatherings or all year long! 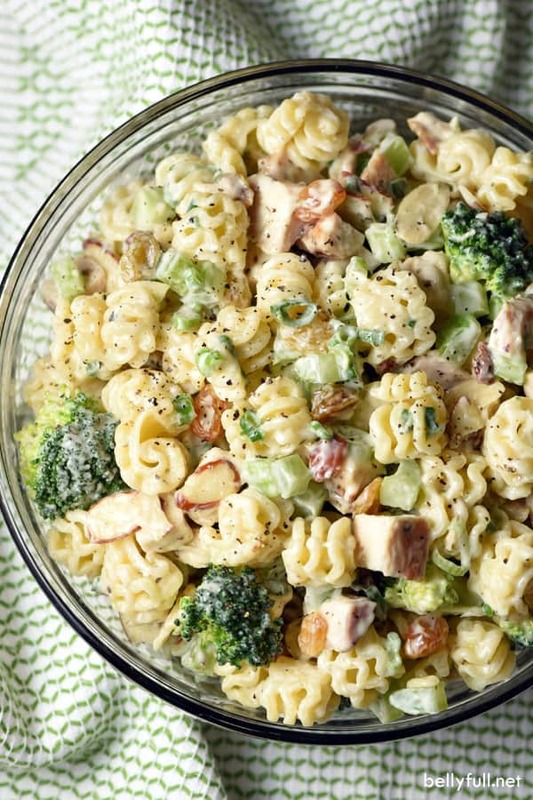 This Chicken Broccoli Pasta Salad is my latest love, you guys! I’ve made it three times in the past month. There are certain foods that I just cannot resist. 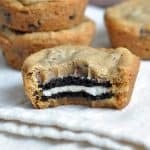 Anything made with Oreos (what is it about them??? ), any Stir-Fry (because Asian flavors and rice. Plus EASY), breakfast casseroles (great for any meal of the day! ), donuts (my absolute weakness. sigh. ), and pasta salad. 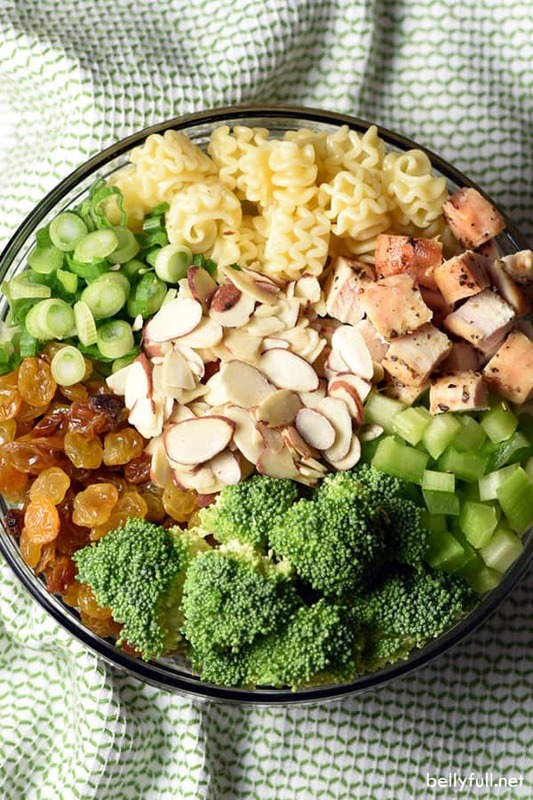 Pasta salads are just the best, no? 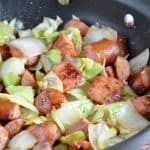 Make a small or huge batch, depending on who you’re feeding, choose between a vinaigrette or creamy dressing, pretty much any pasta works, and you can change up your fruits and vegetables for a soft and crunchy or sweet and salty combo, to create all different types of flavors and textures. I mean, they are truly the most versatile dish. Almost anything goes! 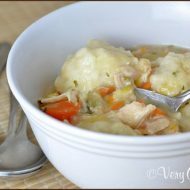 For me, they’re also an absolute life saver for potlucks, during the week, and throughout baseball season, because you can make them ahead of time! We’re in the thick of Little League right now and since Trevor moved up to AAA, most of our games are at 5pm. That means, we either eat dinner at 3pm or 8pm. Or eat nachos from the snack bar every time. What awful options. 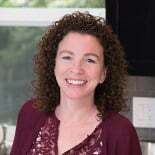 So, I’ve been making my favorite pasta salads to bring with me; we either eat in between innings or in the car on the way home. Also not ideal, but it works. I have a go-to pasta salad with ground beef and bacon, and one with summer sausage, so I thought I would play around with one that uses chicken. This one is also perfection. 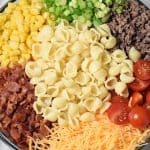 Other Pasta Salad recipes you might like! Bring a large pot of water to a boil; cook pasta until al dente according to package directions. Drain and rinse under cold water. Drizzle with a little olive oil to prevent sticking. 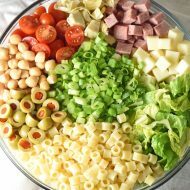 In an extra large bowl, whisk together all the ingredients for the dressing until combined and smooth. 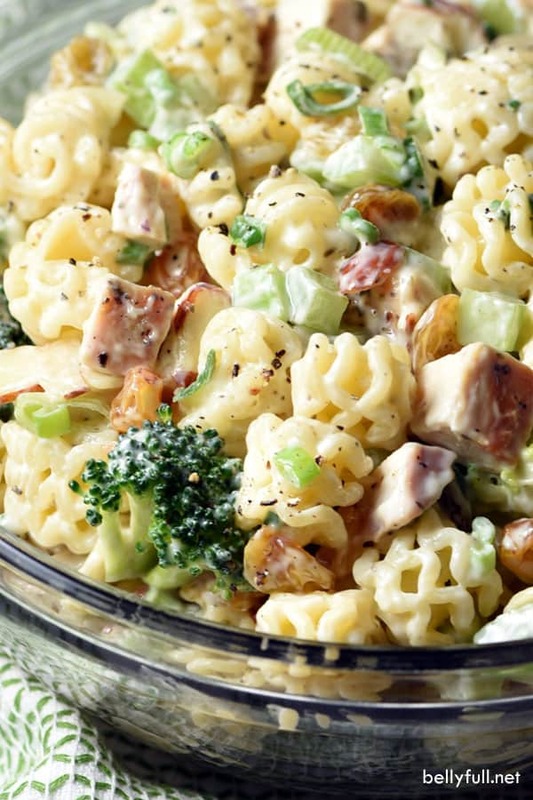 Add in the cooked pasta, chicken, broccoli, raisins, celery, almonds, and scallions; toss to combine and coat. Enjoy right away or refrigerate until ready to serve. • If you cannot find Radiatore pasta, just use any type of small tubular pasta with ridges, which helps the other ingredients and dressing get caught in all the nooks and crannies, making every bite awesome. • This can be made up to 24 hours in advance, but ideally not longer than that because the dressing will begin to loosen. 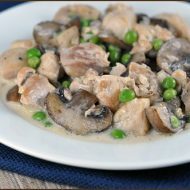 • If making it ahead of time, I recommend adding in the almonds right before serving, so they maintain their crunch. Give the salad a few good stirs to incorporate everything again. 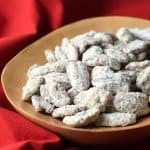 How many points per serving size for Weight Watchers? I am a beginner. I need all the help I can get. Sorry, I don’t have that information since I’m not familiar enough with the Weight Watchers system. You’d need to look at the nutritional information and figure that out, I guess. Thanks, Melissa! 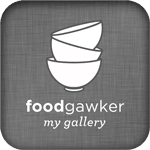 I took all my favorite salads and mixed/matched. HA. And I even added in celery, which you know I hate…and yet…I love it in this. Go figure. 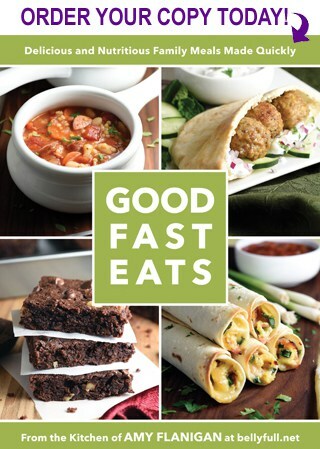 Will definitely make this next week. It looks good for lunch, dinner or a bit of a snack.